Taffy is from the South Wales valleys where at the age of 15 years old entered into a agreement to serve a bona-fide apprenticeship on the 4th day of October 1971 to be taught the craft of stone masonry by old stone masons of that time in a town named Merthyr Tydfil. During the period from October 1971 to October 1974 Taffy served is apprenticeship, he was taught the craft of how to cut the Blue Pennant stone with only hammer and chisel. After two years in the quarries cutting stone in the banker sheds he then moved on to the installing of the stone. At this point Taffy also learned how to fix and cut natural Welsh roof slate for the roofing of the projects he worked on such as historical Heritage buildings from old churches, castles and Industrial protected buildings. On arrival to New Zealand on 21st September 2000 it became apparent to Taffy that the workmanship with regards to stonework was in general substandard and not being done by qualified stone masons. At this point it was decided to establish Celtic Stonework and soon gained the reputation for quality workmanship from a bona-fide trade certified Stone Mason. 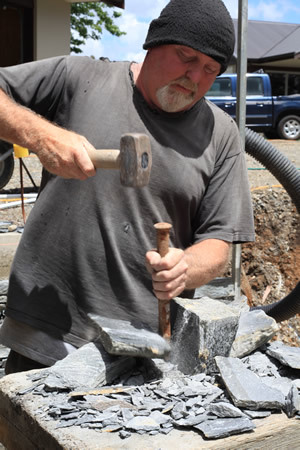 With now over “43” years experience Taffy has become a “Master stone mason”. Celtic Stonework is the only company who openly displays proof of Trade certification and a proven record of an apprenticeship. Celtic Stonework will undertake large and small projects, consult with architects, designers, and landscape/interior designers. With his knowledge regarding stone work Taffy will find a way to provide what the client desires. Taffy is passionate about working with Natural Stone because it is a Sustainable building material which allows him to be creative plus add value to a property, it will also mature with time because it does not have a colour loss not like artificial man made fake schist. Contact us for a free consultation for quality stone work buy a bona fide Trade Certified Stone Mason. Celtic Stonework run a Health and Safety specific safety plan program in conjunction with Hazard Co NZ - who oversee our projects. This plan will be made available to any client who Celtic Stonework is contracted to. This plan is valid to the 12 March 2016. Celtic Stonework hold a Public Liability Indemnity Insurance for a minimum value of $2 Million NZD. A professional Indemnity Insurance for a maximum value of $1 Million NZD. Products Liability up to twice the value of goods provided under any agreement made. Celtic Stonework provides a Maintenance Schedule for work and material provided on our contracts. This is made available on completion of contract.